This LP sports inconsistent sound, sometimes lo-fi, sometimes good. Surf lurks just beneath the murky surface. 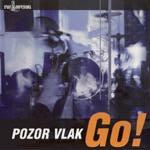 Pozor Vlak are from East Germany (their term, not mine), and are the inverse of bands like the Looney Tunes or the Cruncher. Not a shred of similarity. The writing bears some similarity to an inverted Vibrasonic. The structures and riffs are highly unusual, both surf and morbid. Big thick chord crunch, as ugly as 250,000 bikers at a nudist camp. Thick and gruesome. Relentlessly sledge like, struggling for an anvil that will play a tune. Shreddin' with angst and trauma. Barking dogs permeate the surf chunk in an inverse "Danger" (Gondwanaland) fashion. The shouts and trashing are right outta the soup. Thick soupy sfx give way to delicately double picked surf, with an almost drifting melody line. The imagery of the open currents seem crossed by slightly hazardous breezes, like "Quiet Surf" overlaid by "Paint It Black." A stark aquatic misadventure is at hand. Thick dirty water surf, dangerous and churning, with a simple riff reminding us of the dark side of punk. "Race Face" sports a dissonant sound and a dangerously playful riff. It's dark surf lite, like it's out of tune with the break. Most interesting. Thick and riff driven, with a dangerous detuned dribble. The double picking is dark, while the tone is just ominous. Beneath the melody line runs a sample from s sci-fi flick. Ugly feedback, thrashing chords, hideous distortion, and an evil melody line delivered like a triple-time Hawkwind grinder. Thick, amped with screams, and spread like peanut butter across the rocks. A slow shimmering guitar line vibrates above a relentless bass and drum. It's moody and pretty in an unnerving kinda way. The riff is unvarying, as is the backtrack, leaving only the melancholy... that is until the thick chord progression comes in and exaggerates the menacing side of it. Quite unusual. A very slow sorta jazzy bass, a grunty disoriented guitar line, and the feel of Zappa on a Dewey Webber, then it all speeds up until there's no room for error. But wait, there's more. It drops into a thick morass of dissonance. Thick, heavy, disquieting. More surfy than the rest of the disc, "Camping" sports a solid guitar that goes through several changes in both pace and riff. Part spy, part surf ride, and part Smoky the Bear. Reverby guitar double picking a slightly nasty riff over a grumbling bass and distant drums. The composition straddles the line between melody and simple pattern. The break is a refreshing shift in focus, almost siren like. Pretty cool track. The riff here seems like a fifties kinda thing strained through a punk mindset. Thrashy and relentless. Dark and moody, this is an interesting sandwich of dangerous space, electronic abyss, and relentless machine surf. Quite heavy and intense, cold and adventurous. Bass thumpin' guitar plucking, reverb echo, and a moody optimistic riff. Somewhat metronomic, slightly repetitious, and wholly spooky. Chopping those pesky weeds can be a real job. The gas weed whacker winds up to become part of the band as the fuzz guitar whines and grinds over a military bass and drums. Quite a different sound here. Ugly discordant noise, like Blue Cheer out on your front lawn. An infectious little beat is barely audible under the shimmer of the vibrato and the hum of the bass. Almost middle eastern and foreboding. "Oriental" doesn't sound oriental at all, but it does sound exotic, at least before the speed up. Another highly unusual track.